This article explains the connection between cell phone recycling and Gorillas the hidden connection. Like many people, I never thought there is a connection between cell phone recycling and endangered African gorillas. When I started doing research on the dangerous chemicals found in cell phones , I came across this little known connection between the widespread use of cell phones today and survival of African Eastern Lowland Gorillas. When you consider the sheer number of cell phones being dumped to our landfills every year, the threat of toxic chemicals these cell phones contain: antimony, arsenic, copper, cadmium, lead, and zinc is quite real and alarming. There are 140 million estimated cell phone users in the US today. Due to rapid changes in cell phone technology, it is estimated that the average cell phone user changes their cell phone model very 14 months. Last year, more than 100 million cell phones were discarded, but less than 10% of these were recycled. We shall explore the danger of toxic substances present in cell phones in another post. Today, let’s examine the impact of cell phone production and cell phone recycling on the continued survival of a species of gorillas in Africa, which brings us to the subject of Coltan. What is Coltan? Coltan is the African term for the metallic ore columbite-tantalite used to produce niobium and Tantalum. The metal that allows your cell phone to run efficiently – Tantalum – is the very same metal that’s fueling the civil war in the Congo and decimating gorilla populations in the area. Tantalum is prized for its resistance to corrosion and extreme heat, and is used to produce capacitors and other parts of cell phones, DVD players, laptops, and video game consoles. The burgeoning cell phone and electronics industries by necessity require huge supplies of Tantalum and the ore from which it is derived – Coltan. Coltan is found and mined in several countries, including Australia, Canada, Ethiopia, Nigeria, Zimbabwe, Mozambique, Namibia, South Africa, and Egypt. However, the largest supply is coming from the Congo or the Democratic Republic of Congo (DRC) in Africa, which is believed to possess 80% of the world’s Coltan reserves. 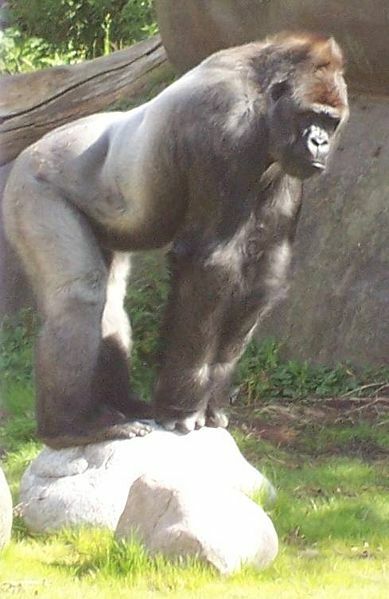 In particular, Coltan is mined extensively in the eastern part of Congo where the Kahuzi Biega National Park, home to the Eastern Lowland Gorilla, is located. Coltan is fueling the war in the Congo. The huge demand for Coltan and its derivative metal Tantalum coming from the cell phone and electronics industries, has jacked up its price in the world market (reaching $600 per kilogram at one time) and has made its mining and extraction quite profitable for the different armed groups (rebels, bandits, Rwandan invading troops, etc.) in the area. Profits from the mining operations by these groups are then used to buy more weapons and ammunitions, thus prolonging the conflict that has already claimed 3.2 million lives since 1998. The Coltan bonanza has also attracted thousands of impoverished migrants into the area. As the mining concerns widen and more people arrive, thousands of acres of tropical forest, the natural habitat of the Eastern Lowland Gorillas (Gorilla beringei graueri) are destroyed. The destruction of their natural habitat and the hunt for “bush meat” to feed the hungry miners and armed groups has brought the Eastern Lowland Gorillas to the very brink of extinction reducing their population by about 90%.. Before the civil war broke out in 1998, there were over 17,000 silverback Gorillas in the Congo. Today, their number is estimated to be below 3,000. While many American cell phone manufacturers since 2001 have taken the position of purchasing Tantalum produced by non-African Coltan suppliers, like Australia and Canada, or from African suppliers who certify that their ores aren’t mined from conflict areas, illegal Coltan mining continues to this day. The ores are smuggled through the bordering countries to Europe and the sheer volume of contraband Coltan in the market makes the likelihood of some blood-tainted Tantalum part of the handset I or you are using today. How can we help? The obvious answer is cell phone recycling. It may not be that simple to end the conflict in Africa, but following the basic law of supply and demand, cell phone recycling would effectively lessen the demand for Coltan by the manufacturers. If done in a concerted and high rate (certainly higher than 9 plus percent rate today), it will make Coltan mining and the collateral forest destruction in the Congo less profitable for the armed groups and migrants. “Most people don’t know that there’s a connection between this metal in their cell phones and the well-being of wildlife in the area where it’s mined,” said Karen Killmar, the associate curator of mammals at the San Diego Zoo, as reported in The National Geographic. “Recycling old cell phones is a way for people to do something very simple that could reduce the need for additional coltan…and help protect the gorillas,” Killmar added. Tide Turners: “Is Your Mobile Fueling The War in the Congo?” For the image depicting boys being used as soldiers in the Congo. Also provides a detailed description of the Coltan trade. Cell Phone Recycling in America, Why Not? Reason why some people are reluctant to recycle their old or used cell phones. Cell Phone Recycling – The Poison in Our Cell Phones . Discusses the toxic heavy metals and chemicals found in cell phones. Powerful content! Well done! It’s unfortunate that we have to destroy everything and drive other species to extinction to fuel our insatiable consumerism. Time for a reboot for a world gone mad. Well done. Sad to see the connections that we never think about. It is IMPOSSIBLE to do ANYTHING without having an effect on something else. Thanks for doing the homework on this one. Recycle that cell phone, folks, please.